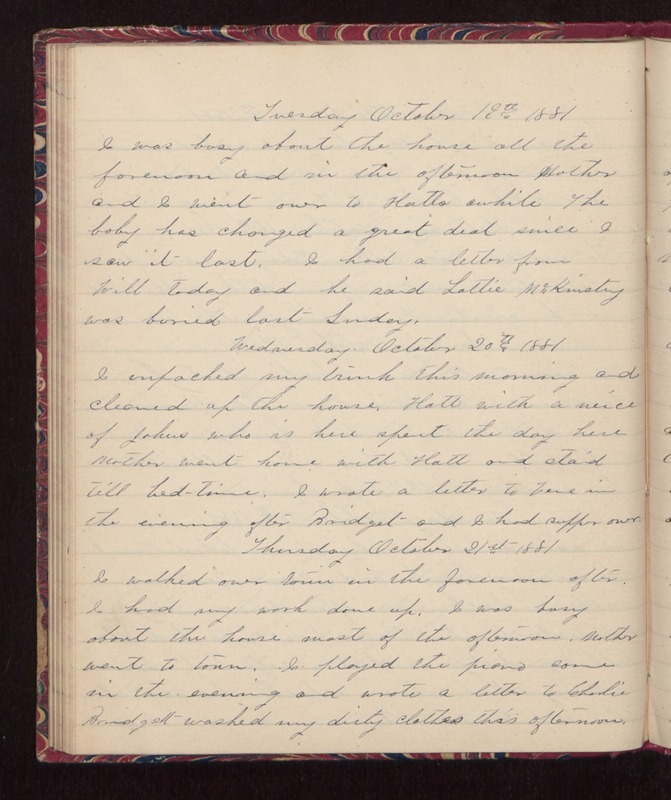 Tuesday October 19th 1881 I was busy about the house all the forenoon and in the afternoon Mother and I went over to Hatts awhile. The baby has changed a great deal since I saw it last. I had a letter from Will today and he said Lottie McKinstry was buried last Sunday. Wednesday October 20th 1881 I unpacked my trunk this morning and cleaned up the house. Hatt with a neice of Johns who is here spent the day here. Mother went home with Hatt and staid till bed-time. I wrote a letter to Vene in the evening after Bridget and I had supper over. Thursday October 21st 1881 I walked over town in the forenoon after I had my work done up. I was busy about the house most of the afternoon. Mother went to town. I played the piano some in the evening and wrote a letter to Charlie. Bridget washed my dirty clothes this afternoon.